Steepers! – We love tea. Tea hasn’t disappeared from our lives, but the blogging part has gone on hiatus due to my new gig at Time Inc. After moving from a temporary conference room to the floor with the other Executive Producers and video team, I’ve been able to make a few pots of tea. A few of the guys appreciate a good cup. They are mostly black, English breakfast and Earl Greys. That said, one of my coworkers brought back a brick of Pu’erh, which went missing. I didn’t have the time to inspect what kind it was. Our thought is either someone knew how good it was and made off with it or a one of the cleaning ladies threw it away. This past week, I made a new Keemun I picked up from Two for the Pot in Brooklyn Heights, which was a bit pricy but good. I’ll do a better review of this later this week, but it held up to a major over steeping and tasted good cold. Truth be told, the office is a great place to make some teas don’t fall under Nicole’s style, like Licorice Mint Herbal from our tea of the month club from Verdant Tea in Minnesota. So, it’s about that time, I show you what’s been preventing me from blogging for three months. We opened our brand new Studio 2A in the Time & Life Building in Rockefeller Center. 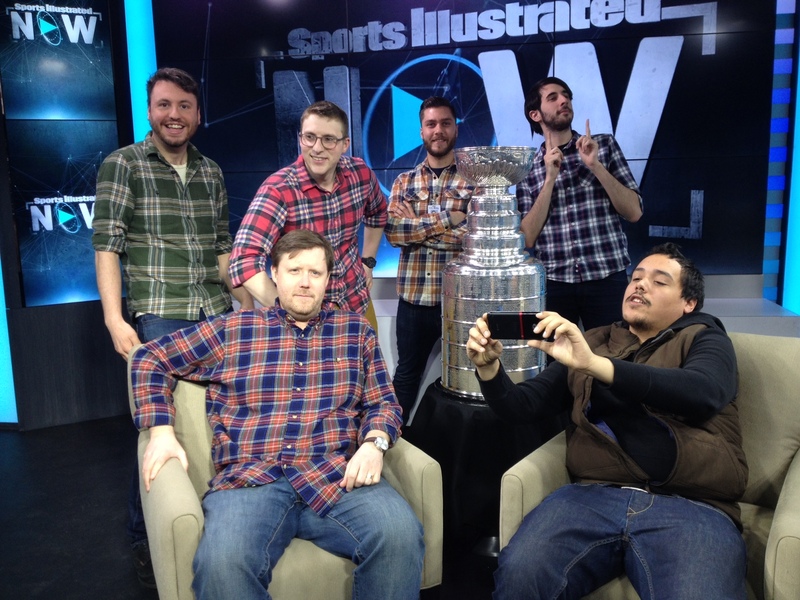 We shoot SI Now for Sports Illustrated live everyday at 1:00 PM. All in all it’s been a great first few months. Now I need to get back to talking tea again. Like how the single cup tea steeper I have has resulted in too many conversations about sperm. More to come on that one. Finally, the first of the Christmas Present reviews! Alexis sent an awesome robot tea steeper. Have to admit, the present was for Chris but I’ve been the one playing with it. Its a robot after all! How could I help it? It’s super fun. Wouldn’t be good for steeping anything too fine, but is perfect for chunkier teas like Tranquil Dream. My favorite part though, is the way it sits in the cup. Perfect for a glass mug like the insulated ones we have. (Well, one, I broke the other. Oops.) The arms adjust to gasp the edges of the cup and it hangs just above the bottom of the mug. 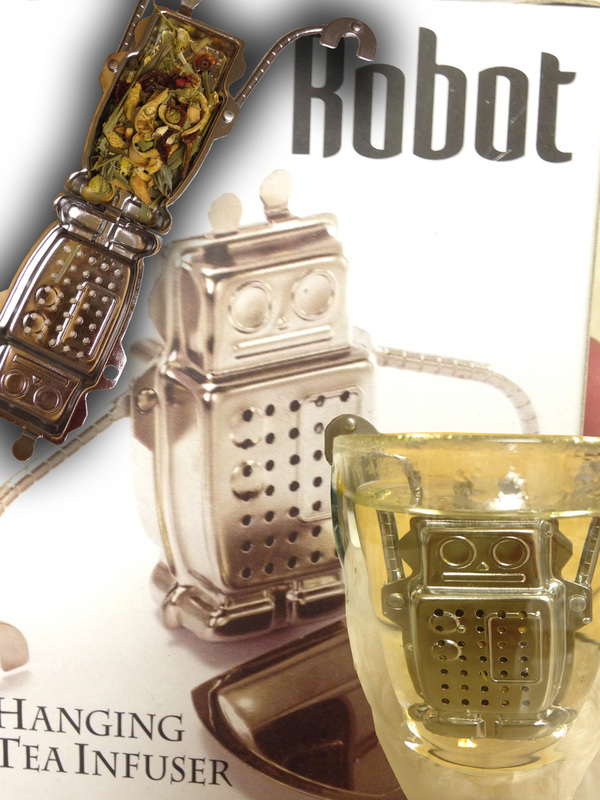 The robot tea steeper is great for an individual mug of tea, so is perfect for my work-at-home afternoons. You wouldn’t want to try to brew too large of a mug, though, because the size of the tea robot wouldn’t allow expansion of the tea leaves if you pack it too full. Fun tea timer to make sure you get the brew you want. When we began our search for apartments in snowy December, we kept our eyes out for local tea shops. I won’t say our apartment hunt was easy- we managed to schedule our meetings with realtors for one of the worst snowstorms of the winter. But we squeezed in a look at one last place, and walked down the street to Teafee to talk to the agent. It’s the shop where we had our first cups of Brooklyn tea, and where we signed the paperwork to make this our new home. So, hi Teaffee! Glad you’re our neighbor! The folks who work at this tea shop are all very nice. Their selection of loose leaf tea is broad, and generally tasty. It is refreshing to have more than just your standard 5 pre-packaged options when ordering a mug. In addition to straight coffee and tea, they offer a namesake drink, Teaffee, that is, as the name implies, a combination of tea and coffee. Perhaps we picked bad teas for the mix, because neither one of us was a huge fan. There is a latte version as well, but my version with a non-dairy milk (I think I ended up with almond milk) was an odd combo. Totally user error on my part for that one though. The space is great to get a mug or a french press to share and get some work done out of the apartment on weekends. Convenient location to get a cup to go when I have to move my car for alternate side parking, too! Well then. Turns out it takes way longer than expected to find new routines when life undergoes massive upheaval. Chris was the mastermind behind many of our posts, and his new (awesome, by the way!) job makes posting to this site pretty hard to maintain. So I’ll be taking over some more of the posting, or at least trying to. I don’t think I have as much of a grasp on the nuances of flavor as he does, so bear with me, but I’ll try to keep up to date on the new things we’re trying. Morning blends don’t happen as often, but we’ll try to test some new ones out on weekends and keep updating. In the meantime, we’ve got a backlog of new teas that I’ll try to work my way through reviewing. 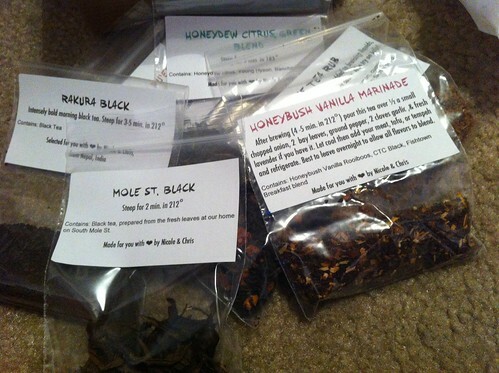 Chris got a great subscription to the Verdant Tea of the Month club from his good friend in Minneapolis, and we have had some time to find some new-to-us tea related places in our new city. Combine that with some way-late-to-review tea related Christmas gifts (sorry Alexis!! ), and I’ve got some work ahead of me! Thanks for your patience, and I hope to have the tea posts streaming along soon. Every year, I struggle with Christmas gifts. Aside from the few young kids that we give to, no one really wants anything anymore. We’re all struggling to reduce our clutter and giving one more cool kitchen gadget just seems expensive and unnecessary. Sure, sometimes you stumble across something perfect, but I find that rarely happens right around Christmas. After a few conversations with friends and family who read our site, I thought it might be fun to give some curated tea selections as gifts. Something unique and fun, and best of all, once you drink the tea it doesn’t take up any space at all. It was a really fun way to share some of the great morning mixes that Chris makes along with some of our favorite teas from local shops. We even got to include some of our Mole St. Black, made from the Boston Teawrights leaves that we got. 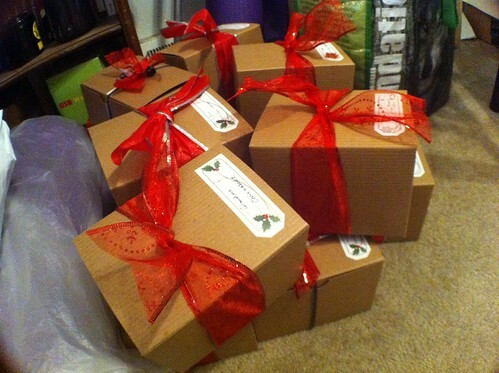 We hope that the tea gifts were well received and that folks have been enjoying sipping on their custom blends! So… perhaps you have noticed the lack of posts lately. We are currently in the middle of relocating from Philadelphia to New York City. Chris just started a new job, and while we’re drinking tea, we haven’t had much time to blog about it. I’m not quite as good as he is about describing the nuanced tones and intricacies of the teas we drink, but I’ll try to update more often. Once we’re settled and start exploring our new city, I’m sure we’ll find plenty of tea to talk about. If you’re in the New York City area (particularly Brooklyn, where we’ll be living) please share your favorite tea spots! 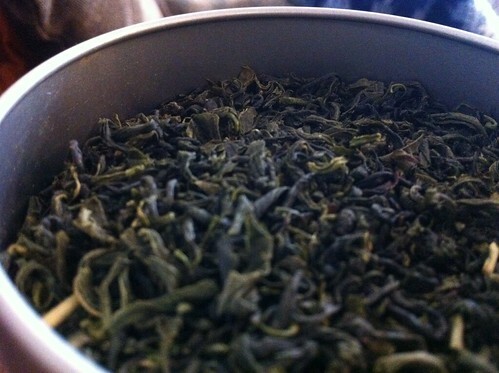 This is our first new green tea from DavidsTea since we thoroughly enjoyed their Sencha Yabukita. We chose it purely because it is Korean. Most of the greens we enjoy are either from Japan or China (sorry everyone else, but that’s what we buy – most times). So here we are with DavidsTea’s Korean Sejak in our cup and we’re enjoying it. Korean tea is exceptionally rare and difficult to find, and this one is worth the trouble. Grown in a monastic style garden in the Halla Mountain slopes of Korea, this tea is lovingly tended by those who enter into a monk lifestyle to devote their lives to tea. The result is a tea that is unusually complex and pleasantly earthy. Count your blessings – each sip is divine salvation. It brews up a mellow yellowish green color with a brothy consistency. We tasted a bit of grass over a slightly seaweed solid earthy base. The flavors stick with you until the next sip, which we don’t mind. All in all it was quite interesting while hot. As our cups cool, the vegital side took over completely. We will definitely keep to drinking this one hot. Produced in the mountainous tea growing region of West Java, this fine-leaf tea has a BT (i.e., “broken tea”) orthodox designation. The caramel-colored cup has a fresh fragrance and a refreshing pungency. This is a versatile tea, which can be enjoyed hot or iced. The Jolotigo Java Orthodox brewed to be quite woody with a citrus twist. This made the cup quite drinkable. Before we knew it, there was nothing left in our cups. That’s always a good sign. And for a tea that isn’t that expensive, even better. We had enough of a sample to mix it a bit. We think of it like a Ceylon with a twist to it. The tea is a broken grade, but doesn’t come with the typical astringency level associate with that processing. This could be a fun one to use as a cheaper base like the Vietnamese CTC style we use to fill out a cup, but we need to keep in mind that it will bring brighter notes and a sense of the woods to any cup. There needs to be a disclaimer to start this post. We LOVE Nuts.com. They don’t have a ton of tea, but they do have a few generic teas like “Ceylon” or “Oolong” followed by a generic description of the region. So basically, it is the exact opposite of shopping for artisan single plantation teas like Tealet. Our guess is that each season, the tea may vary what exact “Ceylon” they are selling, but for the value it’s okay. Last time we ordered we decided to give their Assam a try, which was solid. It actually turned into a cheap base tea for mixing. This time around, we decided to give their Ceylon a try and it landed square in the solid, won’t brake the bank, but is still tasty category. 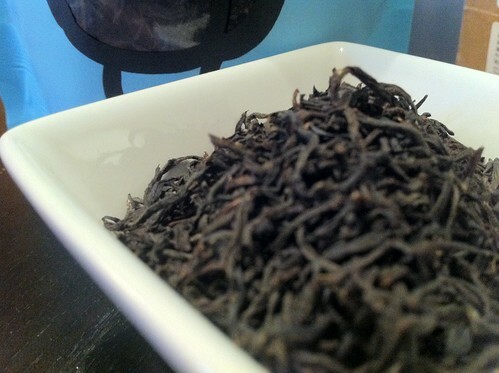 Ceylon black tea is black tea that is grown in the hills of Sri Lanka (which was known as Ceylon before 1972). It has a citrus-like crisp aroma, a beautiful reddish color and a strong, assertive black tea flavor. Most Ceylon tea is grown in mountainous regions of the island at elevations up to 8,000 feet. This is some of the world’s finest black tea. It’s exactly what we looking for from a mixing stand point. We try a ton of teas and each morning we mix them together to make our own concoctions. The issue we have is some mornings we need a solid base black to help fill out another tea that is too sweet, fruity, toasty, fishy or just weird. On those mornings we don’t want to use an expensive nuanced tea. Instead we use a Nuts.com Assam or Ceylon. That’s what these teas are great for and this Ceylon is perfect. Solid body, not too astringent and lightly bright. Just what we’re looking for for. Nothing like a bold black tea to get the juices flowing. This is our first foray with a tea from Sikkim, one of the smallest Indian states (population and size). It is nestled between Nepal on the west and China to the north and east. We are big fans of Nepalese and Himalayan teas in general so it made perfect sense to give these a try. A combination of affordable pricing and bold flavor make this tea an excellent choice for enthusiasts of Sikkim and Darjeeling teas. The aromatic leaves yield a lively, dark golden liquor. The cup has a bold flavor, with toasty notes and a mild, grape-like sweetness. 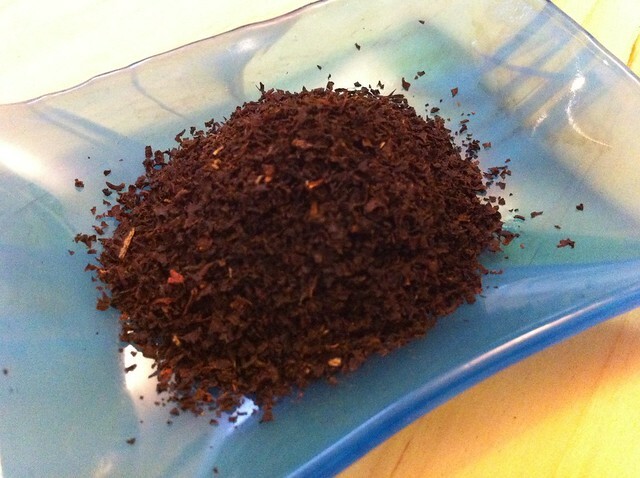 This tea filled our home with an excellent warm feeling of dark toasted malts. 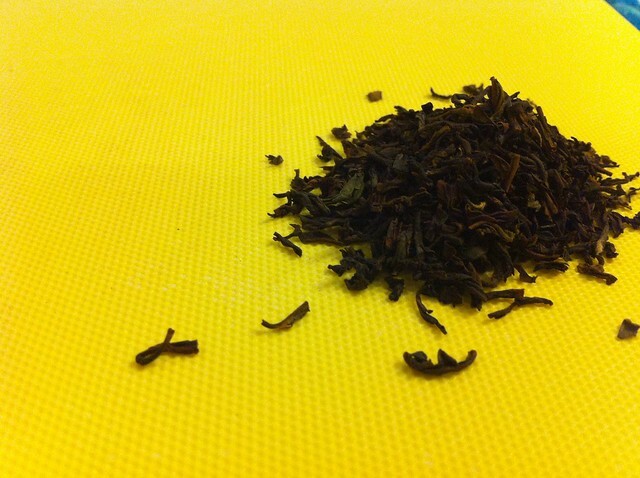 We were wondering how different this tea would be to the the other Darjeelings we enjoy. 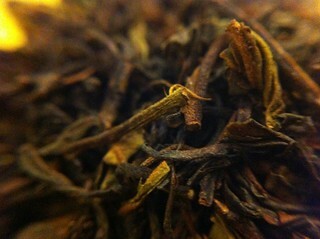 The Sikkim tea is highlighted by the more toasty, woody notes than the more muscatel flavor we see in the Darjeelings. It isn’t better or worse, just different. The body is strong, but not overpowering, which is perfect for us as we never add milk or sugar to our tea. All in all, it’s a great subtle switch from our usual black teas.